Little remains to be said about the success of Broadway mega-smash hit Hamilton, but does it hold up when viewed under the weight of extraordinarily high expectations? The answer is a resounding yes. 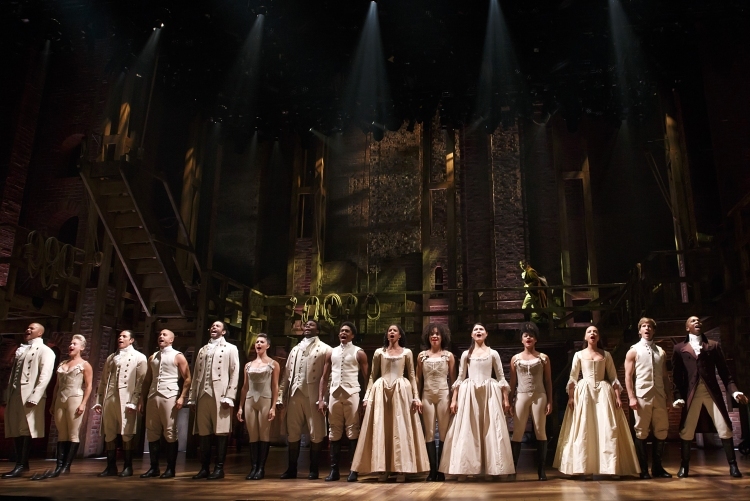 Casting, choreography and costuming are just some of the creative aspects that take Hamilton beyond the quality and innovation of the majority of other Broadway shows. The first surprise is how quietly the actors sing at certain times. When the lights go down, the audience screams like they are at a rock concert and then Leslie Odom, Jr begins in almost whispered tones, forcing the audience to hush and concentrate carefully. The music builds, especially in full company numbers, but the vibe is often soft, expressive singing. Showstoppers, such as act one’s lively battle of “Yorktown,” reach a louder volume. The sophistication of Paul Tazewell’s costume design can really only be fully appreciated when watching the entire show. The modern twists on period looks are stunning, but the clever part is the way costumes help frame the scenes. 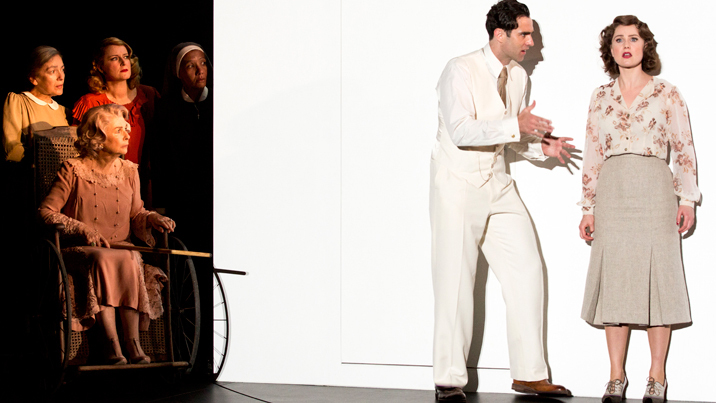 Each member of the company begins in neutral cream-coloured garb and then puts on coloured items as they play featured roles throughout the story. The pale pastel shades of the Schuyler sisters’ satin dresses are gorgeous; the colours remain while the designs cleverly change in fashion with the passing years. The lead men move from rich autumnal tones to fresher spring tones, with the amount of luxurious velvet and silk increasing as the characters’, and the country’s, prosperity increases. The relative simplicity of David Korins’ two-level wooden set is more than compensated by the spectacular colour and dynamics of Howell Binkley’s lighting design. A highlight of Binkley’s work is the beautiful coloured patterns he creates on the stage floor. Andy Blankenbuehler has developed a finely detailed vocabulary of dance for the non-naturalistic choreography. 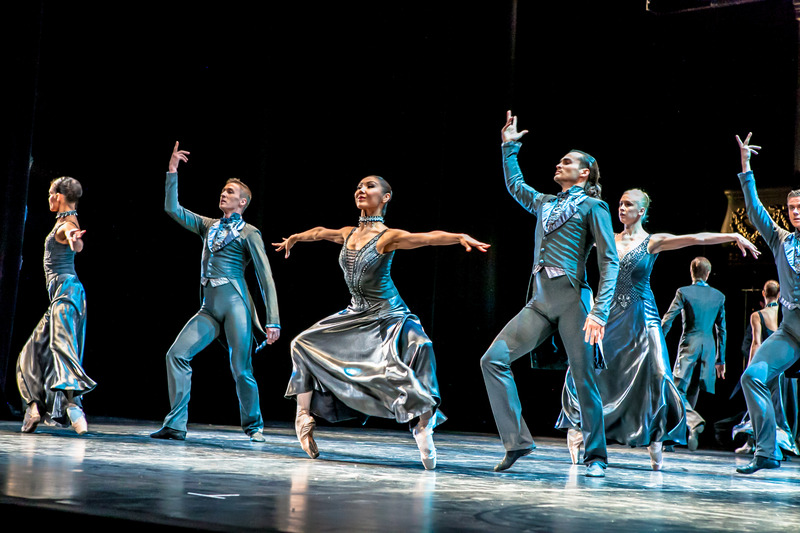 Full company work is astounding as every performer has their own movements. Controlled use of body angles and tight pulsing rhythms create fascinating visual pictures. Placement and removal of props is also performed in a tightly choreographed manner by the ensemble. At this point of the run, the original cast is absolutely on fire in each of their respective performances. Director Thomas Kail has brought out an exciting energy and performance style to complement the funky sound of Lin-Manuel Miranda’s highly original score. Miranda’s book, based on the novel Alexander Hamilton by Ron Chernov, is swift and epic in scope, particularly as compared to the gentle pace of In The Heights. Being almost sung-though gives the work a continuous feel, but Kail has worked to give each new number a distinctive feel and look to help the storytelling progress clearly. Awareness of the score in advance is an asset, but hearing Miranda’s super fast lyrics and complex internal rhymes live is a great aid to fully understanding and appreciating the text. Miranda’s awareness of the work in the history of music theatre is made clear by the snatches of lyrics from The Pirates of Penzance, South Pacific and 1776. The intertwined rivalry of Hamilton and Burr at first brings to mind Javert’s relentless pursuit of Valjean in Les Misérables, but, on further thought, the pair more closely resembles Salieri and Mozart from Amadeus. In this version, however, gifted leader Hamilton (Mozart) is the hero and Burr (lesser composer Salieri) is merely a bitterly jealous compatriot. Miranda takes the chance to make two very brief but salient political points. In act one there is a reference to immigrants reliably getting the job done. In act two, a reference to the US not always being involved in all world conflicts brings a quick cheer. At the first performance I attended, Miranda was taking a well-deserved week’s vacation and I was fortunate enough to see long-time alternate Javier Muñoz in the title role. A strong actor, Muñoz has a kind and gentle style that brings additional sympathy to the man who contributed so greatly to his young country’s growth and success. Miranda had returned for the second performance I attended. The audience response to Miranda’s first appearance on stage is massive but he quickly moves on with the show. It is wonderful to see Miranda perform his own lyrics, especially the special moments where adds the hint of a cheeky grin. Thin metal-rimmed glasses make a big difference to Miranda’s face, giving the gravitas the character needs as he rises in importance. Each member of the supporting cast has clearly been carefully selected for their roles. 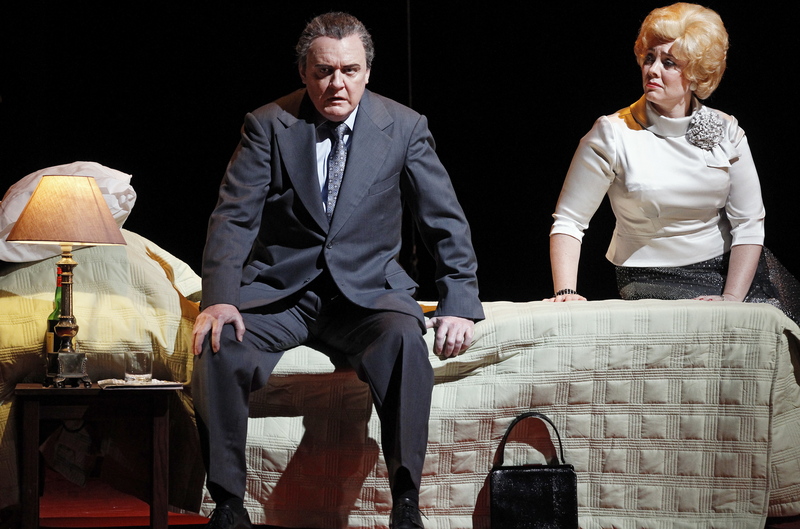 Before seeing the show live, I was unaware of the number of lead cast who played dual roles. With the progression of time, the second act sees a number of new characters join the story. 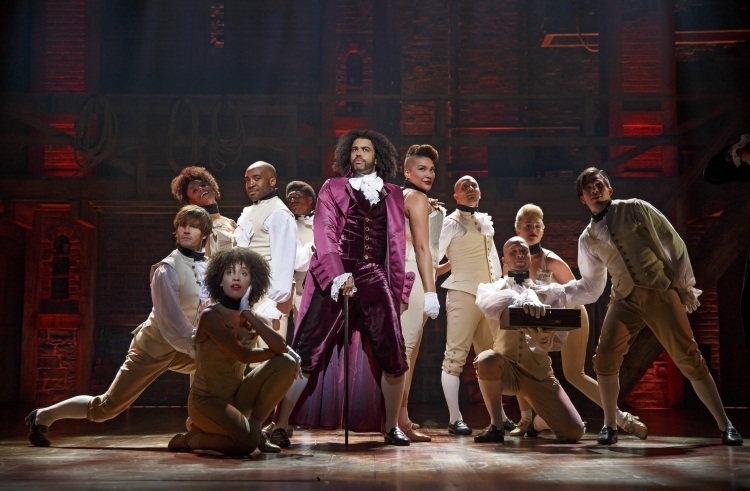 A particular standout for his infectious energy and dazzling style is Daveed Diggs, who first plays the toffy, high-spirited Marquis de Lafayette and returns after interval as America’s third President, driven leader Thomas Jefferson. Odom, Jr maintains an intense focus as frustrated lawyer and politician Aaron Burr, showing the humanity of the character through his loves but never allowing any maudlin sympathy to creep into his approach. Anthony Ramos is strong as noble John Laurens but is really adorable, and heartbreaking, as Hamilton’s young son Philip. Most heartbreaking of all is the tender work of Phillipa Soo as dear Eliza Hamilton (nee Schuyler) as she bravely finishes the story in the final number. Experienced performer Renée Elise Goldsberry portrays Angelica Schuyler’s reckless youth before bringing a centred maturity to the character in later life. Goldsberry’s diction and expression are impeccable. 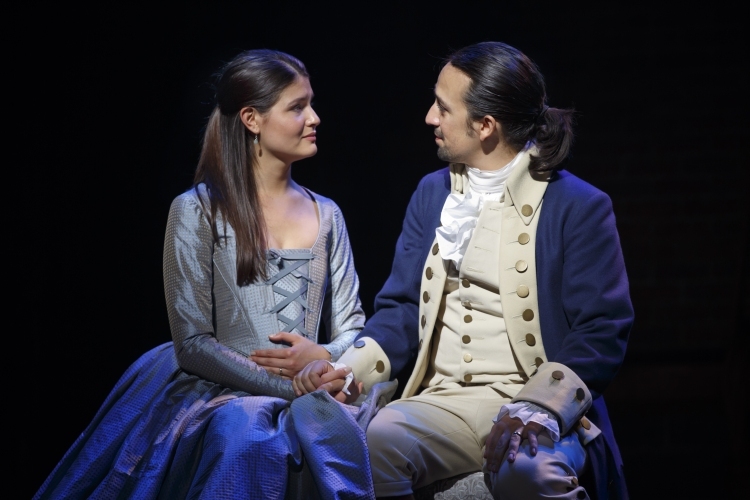 In an immediate flashback sequence following the whirlwind courtship and highly stylised wedding of Hamilton and Eliza, Angelica shares her point of view in “Satisfied,” a number that Goldsberry performs brilliantly, rap and all. 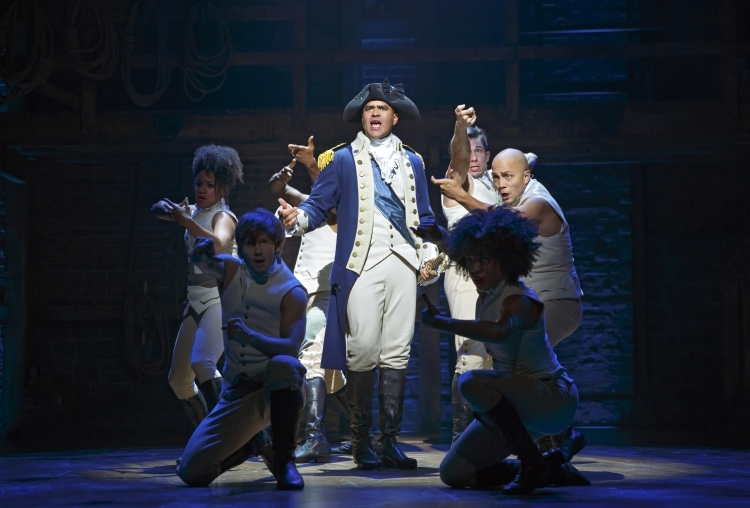 Christopher Jackson, who was also an original cast member of In The Heights, use his height and strong presence to make Washington a real hero. Jackson’s performance of Washington’s soaring final number, “One Last Time,” makes it a fitting finale for the character. 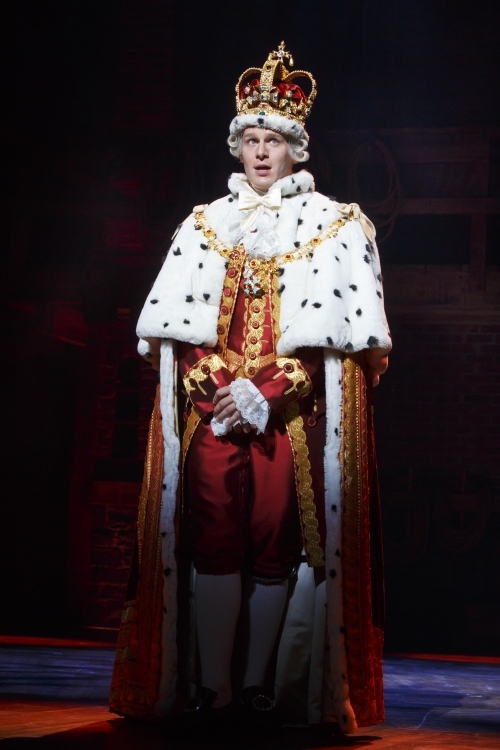 Regally resplendent in red and gold satin, Jonathan Groff brings welcome moments of finely honed comic relief whenever he appears as haughty monarch King George, who is presented much in the same vein as Hitler in The Producers. I booked nine months in advance for Hamilton. Similar dedication in keen ticket buyers is strongly encouraged as the outcome is extremely rewarding. 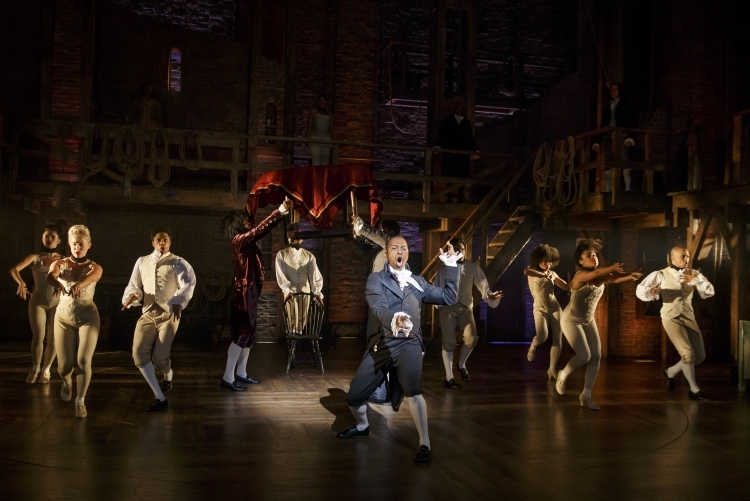 Hamilton was reviewed 2pm 30 March 2016 and 2pm 6 April 2016 at Richard Rodgers Theatre, New York. Hamilton is set to re-open London’s Victoria Palace Theatre in 2017. Brilliant review! You’ve captured it beautifully, Simon! Your words brought back such wonderful remembrance of those performances to me. Always loved Mr. Munoz and Mr Diggs and all the men (hopefully I’ll be able to book a 2nd view, and actually see Lin-Manuel Miranda). However, the women really kicked in for me upon consistent listening to the cast album…Ms. Soo and Ms. Goldsberry are marvelous. Love the Mozart/Salieri comparison! Excellent job as always, Simon. 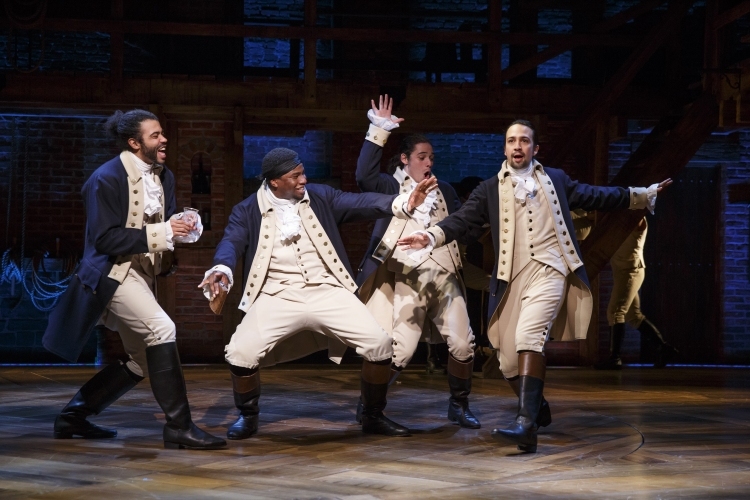 Next stops for “Hamilton”…Pulitzer and Tony! Thanks very much Mark. Diggs and Goldsberey were definitely my two favourites. Keep an eye out for the next release of tickets. I am going to do the same – may have to see the show again this time next year!